Provides family activities from Shrove Tuesday through to Easter Day A mix of crafts, cooking and games, set alongside passages and suggestions for discussion from the Easter story Explains the Lent and Easter traditions which have developed over the years. 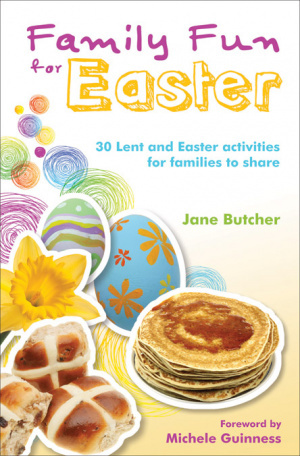 Family Fun for Easter will help you to share the meaning of Lent and Easter with your children in thirty 'family moments', to explore faith in the home and have lots of fun together. Easter activities are structured to take the family through the season of Lent from Shrove Tuesday to Easter Day, including Mothering Sunday. 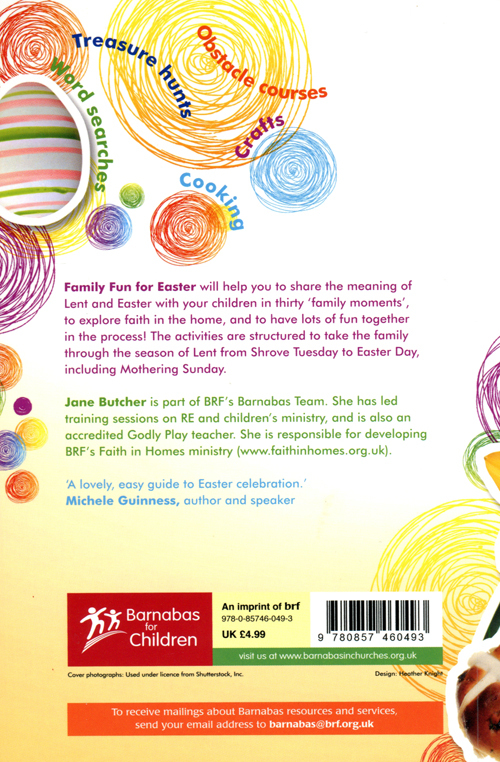 Family Fun For Easter by Jane Butcher was published by Barnabas in November 2011 and is our 1455th best seller. The ISBN for Family Fun For Easter is 9780857460493. This would be a nice book to give to a family who was new to celebrating Lent and Easter. It contains all the good basic ideas you need such as a recipe for pancakes, simnel cake and hot cross buns, instructions for making an Easter Garden or having an Easter egg hunt in your garden and a few ideas for games such as pin the tail on the donkey, egg and spoon races and hunting for silver. There are a few wordsearches for children, an outline for how to hold a Passover meal and some cooking suggestions such as making ‘empty tomb’ rolls and Easter biscuits. There is a useful page at the beginning of each section to explain what Lent, Shrove Tuesday, Mothering Sunday etc are all about. Following this is the relevant Bible story told in a child friendly way. For church leaders and Sunday school teachers, there won’t be much for you in this book that you didn’t know already, but it would be a lovely gift for a family who is new to church and would give them a good grounding in what Lent and Easter is all about. Take a peek at some articles related to Family Fun For Easter . Got a question? No problem! Just click here to ask us about Family Fun For Easter .